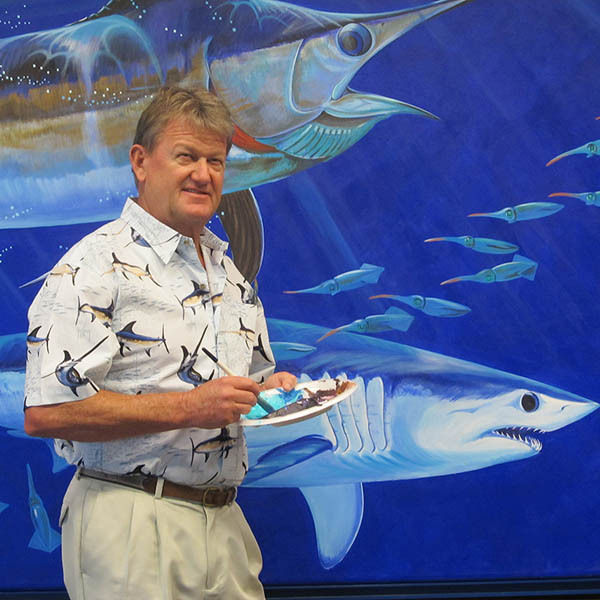 World-renowned artist/angler/scientist/conservationist/underwater photographer Guy Harvey has been captivated by the undersea world since childhood, fishing along Jamaica's southern coast and drawing the island's marine creatures. At English boarding school, he sketched scenes from Hemingway's "Old Man and the Sea" to help ease his homesickness. In the early 1980s, Harvey earned his Ph.D. from the University of the West Indies in Jamaica; his dissertation included 119 of his coastal fish illustrations. Those drawings led to a successful one-man art show in 1985 and his U.S. debut the following year. Harvey's early commercial artistic creations were T-shirts with fish illustrations that became so popular that his enterprises quickly burgeoned into clothing lines, jewelry, water colors and acrylics, giant murals, restaurants, resorts, and more. Harvey has dived and fished all over the world. His angling achievements include catching all nine billfish species and two granders--marlin of 1,000 pounds or more--released the same day off Madeira in the north Atlantic. In the mid 1990s, Harvey became deeply involved in underwater video and photography and began producing television and cinema documentaries on recreational fishing and conservation. An IGFA International Representative since 1986, he has been a Trustee since 1993 and a member of the Fishery Conservation Committee. His Guy Harvey Research Institute, established in 2000 at Nova Southeastern University near Fort Lauderdale, is a world leader in shark research. The non-profit Guy Harvey Ocean Foundation helps fund numerous marine scientific and educational programs.